This year we had the pleasure of holding what has now become a tradition: our annual conference on psychogenic non-epileptic seizures (PNES)—our fourth annual conference! Some things were new this year though. To begin with, we moved our conference location from Mahwah, NJ to Morristown, NJ, where the Morristown Medical Center generously offered to host our event. Different than other years, we were not in charge of organizing a lot of the nitty gritty aspects of the event including catering, setting up rooms and A/V issues. We did however organize our speaker schedules and enlisted a group of experts in different areas of epilepsy and PNES. We were also so fortunate to have our usual incredible support staff on the ground from beginning to end, handling registration, information and donations at the booths and helping direct everyone to the right spot and keeping us running on time. As always, their work was impeccable. Just to name a few that were outstanding: Sonya, Bridget, Kim, Lucy, Melissa, and many more who know who they are. 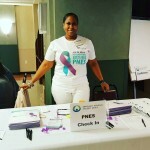 Our PNES conference covered the following topics: Introduction to PNES, Diagnosing PNES, empirically validated treatments and those in the frontiers, the neuropsychology of PNES, maintaining quality of life in PNES, and caring for the caregiver. We also had the pleasure of having PNES warriors/advocates, Millie and Eric L. Nelson speak about their work on Facebook with the PNES caregivers network page, Eric’s continuous support of persons living with PNES across the globe, practical issues about seizure dogs, and much more. And as has become a tradition too, we had our usual round table at the end of the day where all who attended had a chance to speak with the group, discuss their history, struggles and aspirations. That, as always, in my opinion and according to one of our speakers who is a clinical psychologist, was the most moving and powerful part of the day. Our audience was notable too because we had several known faces in the room with some who have now come to the conference at least twice and some who have even come to ALL four meetings! It felt like a group of old friends at times with audience members hugging each other. I also received my fair share of hugs from people I recognized from past years. There were several who had traveled from out of state to be with us too, including Texas, Virginia, North Carolina, Pennsylvania, Connecticut, and New York. And then there were also international guests from Canada and Jamaica! Audience members were patients, spouses, parents, cousins, children, friends, and a variety of caregivers. We also had the great fortune of having a good number of nurses attending, one of whom told me that she had recently worked with a patient who had PNES and was so glad to attend this conference, so she would be better prepared to work with her future PNES patients. Another was a school nurse who mentioned she has a child under her care who has been diagnosed with PNES.Â Isn’t it wonderful to see how health professionals coming in on a weekend to learn more about this condition because they want to provide the best help possible to their patients? In sum, the fourth Annual PNES conference on October 28 was a fantastic event. I hope it helped those who attended learn much more about their health condition and the treatment options and also energized them to continue to fight for awareness and de-stigmatization of PNES when dealing with the general public and with those who work in the health field. Was anything recorded or available on YouTube or via webinar? I am desperately looking for more information for my 15 yr old daughter on this condition. Why wasn’t this announced here prior to the conference date? I have family and friends near to your location who would like to participate in your conferences. It seems this blog fell into neglect over the last few months… no updates seen… I was checking since although my “PNES” turned out to be something else, I am trying to connect other PNES patients with your resources. Hello! It was being reminded on site and other places. I’ve compiled a PNES resource list. I just wanted to thank you and all the staff and voluteers that put together this great event. this was my first conference and probably wont be my last. I’m hoping I will be able to bring some family members next time. They couldn’t attend due to sickness. Looking forward to seeing everyone again.